The north portal of the 11th-centuryUrnes stave church has been interpreted as containing depictions of snakes and dragons that represent Ragnarök. In Norse mythology, Ragnarök is a series of future events, including a great battle, foretold to ultimately result in the death of a number of major figures (including thegods Odin, Thor, Týr, Freyr, Heimdallr, and Loki), the occurrence of various natural disasters, and the subsequent submersion of the world in water. Afterward, the world will resurface anew and fertile, the surviving and returning gods will meet, and the world will be repopulated by two human survivors. Ragnarök is an important event in the Norse mythology, and has been the subject of scholarly discourse and theory throughout the history of Germanic studies. The event is attested primarily in the Poetic Edda, compiled in the 13th century from earlier traditional sources, and the Prose Edda, written in the 13th century by Snorri Sturluson. In the Prose Edda, and in a single poem in the Poetic Edda, the event is referred to as Ragnarök or Ragnarøkkr (Old Norse "Fate of the Gods" and "Twilight of the Gods" respectively), a usage popularised by 19th-century composerRichard Wagner with the title of the last of his Der Ring des Nibelungen operas,Götterdämmerung (1876). The Old Norse compound ragnarok has a long history of interpretation. Its first element, ragna, is unproblematic, being the genitive plural of regin (n. pl.) "the ruling powers, gods". The second element is more problematic, as it occurs in two variants, -rök and -røkkr. Writing in the early 20th century, philologist Geir Zoëga treats the two forms as two separate compounds, glossing ragnarök as "the doom or destruction of the gods" and ragnarøkkr as "the twilight of the gods". The plural noun rök, has several meanings, including "development, origin, cause, relation, fate." The word ragnarök as a whole is then usually interpreted as the "final destiny of the gods." The singular form ragnarøk(k)r is found in a stanza of the Poetic Edda poem Lokasenna, and in the Prose Edda. The nounrøk(k)r means "twilight" (from a verb røkkva "to grow dark"), suggesting a translation "twilight of the gods". This reading was widely considered a result of folk etymology, or a learned reinterpretation, of the original term due to the merger of /ǫ/ and /ø/ in Old Icelandic after ca. 1200 (nevertheless giving rise to the calque Götterdämmerung "Twilight of the Gods" in the German reception of Norse mythology). However, Haraldur Bernharðsson in a 2007 paper suggested that the singular form -røkr "twilight" (from a Proto-Germanic *rekwa) might have been the original reading. Haraldur argues that the wordsragnarök and ragnarøkkr are closely related, etymologically and semantically, and suggests a meaning of "renewal of the divine powers." Other terms used to refer to the events surrounding Ragnarök in the Poetic Edda include aldar rök (aldar means age, "end of an age") from a stanza of Vafþrúðnismál, tíva rök from two stanzas of Vafþrúðnismál, þá er regin deyja ("when the gods die") from Vafþrúðnismál, unz um rjúfask regin ("when the gods will be destroyed") from Vafþrúðnismál, Lokasenna, andSigrdrífumál, aldar rof ("destruction of the age") from Helgakviða Hundingsbana II, regin þrjóta ("end of the gods") fromHyndluljóð, and, in the Prose Edda, þá er Muspellz-synir herja ("when the sons of Muspell move into battle") can be found in chapters 18 and 36 of Gylfaginning. The völva then describes three roosters crowing: In stanza 42, the jötunn herdsmanEggthér sits on a mound and cheerfully plays his harp while the crimson roosterFjalar (Old Norse "hider, deceiver") crows in the forest Gálgviðr. The golden rooster Gullinkambi crows to the Æsir in Valhalla, and the third, unnamed soot-red rooster crows in the halls of the underworld location of Hel in stanza 43. The "sons of Mím" are described as being "at play", though this reference is not further explained in surviving sources. Heimdall raises the Gjallarhorn into the air and blows deeply into it, and Odin converses with Mím's head. The world treeYggdrasil shudders and groans. The jötunn Hrym comes from the east, his shield before him. The Midgard serpent Jörmungandr furiously writhes, causing waves to crash. "The eagle shrieks, pale-beaked he tears the corpse," and the ship Naglfarbreaks free thanks to the waves made by Jormungandr and sets sail from the east. The fire jötnar inhabitants of Muspelheim come forth. The völva continues that Jötunheimr, the land of the jötnar, is aroar, and that the Æsir are in council. The dwarfs groan by their stone doors. Surtr advances from the south, his sword brighter than the sun. Rocky cliffs open and the jötnar women sink. The gods then do battle with the invaders: Odin is swallowed whole and alive fighting the wolf Fenrir, causing his wife Frigg her second great sorrow (the first being the death of her son, the god Baldr). Odin's son Víðarr avenges his father by rending Fenrir's jaws apart and stabbing it in the heart with his spear, thus killing the wolf. The serpent Jörmungandr opens its gaping maw, yawning widely in the air, and is met in combat by Thor. Thor, also a son of Odin and described here as protector of the earth, furiously fights the serpent, defeating it, but Thor is only able to take nine steps afterward before collapsing. The god Freyr fights Surtr and loses. After this, people flee their homes, and the sun becomes black while the earth sinks into the sea, the stars vanish, steam rises, and flames touch the heavens. The völva sees the earth reappearing from the water, and an eagle over a waterfall hunting fish on a mountain. The surviving Æsir meet together at the field of Iðavöllr. They discuss Jörmungandr, great events of the past, and the runic alphabet. In stanza 61, in the grass, they find the golden game pieces that the gods are described as having once happily enjoyed playing games with long ago (attested earlier in the same poem). The reemerged fields grow without needing to be sown. The gods Höðr and Baldr return from Hel and live happily together. The völva says that the god Hœnir chooses wooden slips for divination, and that the sons of two brothers will widely inhabit the windy world. She sees a hall thatched with gold in Gimlé, where nobility will live and spend their lives pleasurably.Stanzas 65, found in the Hauksbók version of the poem, refers to a "powerful, mighty one" that "rules over everything" and who will arrive from above at the court of the gods (Old Norse regindómr), which has been interpreted as a Christianaddition to the poem. In stanza 66, the völva ends her account with a description of the dragon Níðhöggr, corpses in his jaws, flying through the air. The völva then "sinks down." It is unclear if stanza 66 indicates that the völva is referring to the present time or if this is an element of the post-Ragnarök world. The Vanir god Njörðr is mentioned in relation to Ragnarök in stanza 39 of the poemVafþrúðnismál. In the poem, Odin, disguised as Gagnráðr faces off with the wise jötunn Vafþrúðnir in a battle of wits. Vafþrúðnismál references Njörðr's status as a hostage during the earlier Æsir–Vanir War, and that he will "come back home among the wise Vanir" at "the doom of men." In stanza 44, Odin poses the question to Vafþrúðnir as to who of mankind will survive the "famous" Fimbulwinter ("Mighty Winter"). Vafþrúðnir responds in stanza 45 that those survivors will be Líf and Lífþrasir, and that they will hide in the forest ofHoddmímis holt, that they will consume the morning dew, and will produce generations of offspring. In stanza 46, Odin asks what sun will come into the sky after Fenrir has consumed the sun that exists. Vafþrúðnir responds that Sól will bear a daughter before Fenrir assails her, and that after Ragnarök this daughter will continue her mother's path. In stanza 51, Vafþrúðnir states that, after Surtr's flames have been sated, Odin's sons Víðarr and Váli will live in the temples of the gods, and that Thor's sons Móði and Magni will possess the hammer Mjolnir. In stanza 52, the disguised Odin asks the jötunn about Odin's own fate. Vafþrúðnir responds that "the wolf" will consume Odin, and that Víðarr will avenge him by sundering its cold jaws in battle. Odin ends the duel with one final question: what did Odin say to his son before preparing his funeral pyre? With this, Vafþrúðnir realizes that he is dealing with none other than Odin, whom he refers to as "the wisest of beings," adding that Odin alone could know this. Odin's message has been interpreted as a promise of resurrection to Baldr after Ragnarök. Ragnarök is briefly referenced in stanza 40 of the poem Helgakviða Hundingsbana II. Here, the valkyrie Sigrún's unnamed maid is passing the deceased hero Helgi Hundingsbane's burial mound. Helgi is there with a retinue of men, surprising the maid. The maid asks if she is witnessing a delusion since she sees dead men riding, or if Ragnarök has occurred. In stanza 41, Helgi responds that it is neither. Snorri Sturluson's Prose Edda quotes heavily from Völuspá and elaborates extensively in prose on the information there, though some of this information conflicts with that provided in Völuspá. In the Prose Edda book Gylfaginning, various references are made to Ragnarök. Ragnarök is first mentioned in chapter 26, where the throned figure of High, king of the hall, tells Gangleri (King Gylfi in disguise) some basic information about the goddess Iðunn, including that her apples will keep the gods young until Ragnarök. In chapter 34, High describes the binding of the wolf Fenrir by the gods, causing the god Týr to lose his right hand, and that Fenrir remains there until Ragnarök. Gangleri asks High why, since the gods could only expect destruction from Fenrir, they did not simply kill Fenrir once he was bound. High responds that "the gods hold their sacred places and sanctuaries in such respect that they chose not to defile them with the wolf's blood, even though the prophecies foretold that he would be the death of Odin." As a consequence of his role in the death of the god Baldr, Loki (described as father of Fenrir) is bound on top of three stones with the internal organs of his son Narfi(which are turned into iron) in three places. There, venom drops onto his face periodically from a snake placed by the jötunn Skaði, and when his wife Sigynempties the bucket she is using to collect the dripping venom, the pain he experiences causes convulsions, resulting in earthquakes. Loki is further described as being bound this way until the onset of Ragnarök. Chapter 51 provides a detailed account of Ragnarök interspersed with various quotes from Völuspá, while chapters 52 and 53 describe the aftermath of these events. In Chapter 51, High states the first sign of Ragnarök will be Fimbulwinter, during which time three winters will arrive without a summer, and the sun will be useless. High details that, prior to these winters, three earlier winters will have occurred, marked with great battles throughout the world. During this time, greed will cause brothers to kill brothers, and fathers and sons will suffer from the collapse of kinship bonds. High then quotes stanza 45 ofVöluspá. Next, High describes that the wolf will first swallow the sun, and then his brother the moon, and mankind will consider the occurrence as a great disaster resulting in much ruin. The stars will disappear. The earth and mountains will shake so violently that the trees will come loose from the soil, the mountains will topple, and all restraints will break, causing Fenrir to break free from his bonds. High relates that the great serpent Jörmungandr, also described as a child of Loki in the same source, will breach land as the sea violently swells onto it. The ship Naglfar, described in the Prose Edda as being made from the human nails of the dead, is released from its mooring, and sets sail on the surging sea, steered by a jötunn named Hrym. At the same time, Fenrir, eyes and nostrils spraying flames, charges forward with his mouth wide open, his upper jaw reaching to the heavens, his lower jaw touching the earth. At Fenrir's side, Jörmungandr sprays venom throughout the air and the sea. During all of this, the sky splits into two. From the split, the "sons of Muspell" ride forth. Surtr rides first, surrounded by flames, his sword brighter than the sun. High says that "Muspell's sons" will ride across Bifröst, described in Gylfaginning as a rainbow bridge, and that the bridge will then break. The sons of Muspell (and their shining battle troop) advance to the field of Vígríðr, described as an expanse that reaches "a hundred leagues in each direction," where Fenrir, Jörmungandr, Loki (followed by "Hel's own"), and Hrym (accompanied by all frost jötnar) join them. While this occurs, Heimdallr stands and blows the Gjallarhorn with all his might. The gods awaken at the sound, and they meet. Odin rides to Mímisbrunnr in search of counsel from Mímir. Yggdrasil shakes, and everything, everywhere fears. High relates that the Æsir and the Einherjar dress for war and head to the field. Odin, wearing a gold helmet and an intricate coat of mail, carries his spear Gungnirand rides before them. Odin advances against Fenrir, while Thor moves at his side, though Thor is unable to assist Odin because he has engaged Jörmungandr in combat. 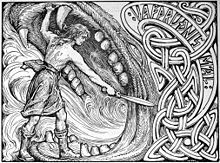 According to High, Freyr fiercely fights with Surtr, but Freyr falls because he lacks the sword he once gave to his messenger, Skírnir. The hound Garmr(described here as the "worst of monsters") breaks free from his bonds in front ofGnipahellir, and fights the god Týr, resulting in both of their deaths. Thor kills Jörmungandr, yet is poisoned by the serpent, and manages to walk nine steps before falling to the earth dead. Fenrir swallows Odin, though immediately afterward his son Víðarr kicks his foot into Fenrir's lower jaw, grips Fenrir's upper jaw, and rips apart Fenrir's mouth, killing Fenrir. Loki fights Heimdallr, and the two kill one another. Surtr covers the earth in fire, causing the entire world to burn. High quotes stanzas 46 to 47 of Völuspá, and additionally stanza 18 of Vafþrúðnismál (the latter relating information about the battlefield Vígríðr). At the beginning of chapter 52, Gangleri asks "what will be after heaven and earth and the whole world are burned? All the gods will be dead, together with the Einherjar and the whole of mankind. Didn't you say earlier that each person will live in some world throughout all ages?" The figure of Third, seated on the highest throne in the hall, responds that there will be many good places to live, but also many bad ones. Third states that the best place to be is Gimlé in the heavens, where a place exists called Okolnir that houses a hall calledBrimir—where one can find plenty to drink. Third describes a hall made of red goldlocated in Niðafjöll called Sindri, where "good and virtuous men will live." Third further relates an unnamed hall in Náströnd, the beaches of the dead, that he describes as a large repugnant hall facing north that is built from the spines of snakes, and resembles "a house with walls woven from branches;" the heads of the snakes face the inside of the house and spew so much venom that rivers of it flow throughout the hall, in which oath breakers and murderers must wade. Third here quotes Völuspá stanzas 38 to 39, with the insertion of original prose stating that the worst place of all to be is in Hvergelmir, followed by a quote from Völuspá to highlight that the dragon Níðhöggr harasses the corpses of the dead there. Chapter 53 begins with Gangleri asking if any of the gods will survive, and if there will be anything left of the earth or the sky. High responds that the earth will appear once more from the sea, beautiful and green, where self-sown crops grow. The field Iðavöllr exists where Asgard once was, and, there, untouched by Surtr's flames, Víðarr and Váli reside. Now possessing their father's hammer Mjölnir, Thor's sons Móði and Magni will meet them there, and, coming from Hel, Baldr and Höðr also arrive. Together, they all sit and recount memories, later finding the gold game pieces the Æsir once owned. Völuspá stanza 51 is then quoted. High reveals that two humans, Líf and Lífþrasir, will have also survived the destruction by hiding in the wood Hoddmímis holt. These two survivors consume the morning dew for sustenance, and from their descendants the world will be repopulated.Vafþrúðnismál stanza 45 is then quoted. The personified sun, Sól, will have a daughter at least as beautiful as she, and this daughter will follow the same path as her mother. Vafþrúðnismál stanza 47 is quoted, and so ends the foretelling of Ragnarök in Gylfaginning. Various objects have been identified as depicting events from Ragnarök. Thorwald's Cross, a partially surviving runestone erected at Kirk Andreas on the Isle of Man, depicts a bearded human holding a spear downward at a wolf, his right foot in its mouth, while a large bird sits at his shoulder. Rundata dates it to 940,while Pluskowski dates it to the 11th century. This depiction has been interpreted as Odin, with a raven or eagle at his shoulder, being consumed by Fenrir at Ragnarök. 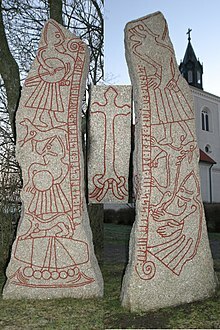 On the other side of the stone is a depiction of a large cross and another image parallel to the Odin figure that has been described as Christ triumphing over Satan. These combined elements have led to the cross as being described as "syncretic art"; a mixture of pagan and Christian beliefs. The Gosforth Cross (920–950), in Cumbria, England, is a standing cross of a typical Anglo-Saxon form, carved on all sides of the long shaft, which is nearly square in section. Apart from panels of ornament, the scenes include a Christian crucifixion, and possibly another scene in Hell, but the other scenes are generally interpreted as narrative incidents from the Ragnarök story, even by a scholar as cautious of such interpretations as David M. Wilson. The Ragnarök battle itself may be depicted on the north side. The cross features various figures depicted in Borre style, including a man with a spear facing a monstrous head, one of whose feet is thrust into the beast's forked tongue and on its lower jaw, while the other is placed against its upper jaw, a scene interpreted as Víðarr fighting Fenrir. 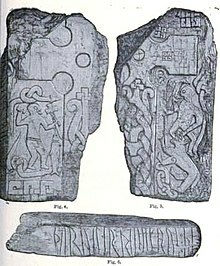 The 11th century Ledberg stone in Sweden, similarly to Thorwald's Cross, features a figure with his foot at the mouth of a four-legged beast, and this may also be a depiction of Odin being devoured by Fenrir at Ragnarök. Below the beast and the man is a depiction of a legless, helmeted man, with his arms in a prostrate position. The Younger Futhark inscription on the stone bears a commonly seen memorial dedication, but is followed by an encoded runic sequence that has been described as "mysterious," and "an interesting magic formula which is known from all over the ancient Norse world." Jansson (1987) notes that at the time of the inscription, everyone who read the lines would have thought of Ragnarök and the allusion that the father found fitting as an expression of his grief. Rudolf Simek theorizes that the survival of Líf and Lífþrasir at the end Ragnarök is "a case of reduplication of the anthropogeny, understandable from the cyclic natureof the Eddic eschatology". Simek says that Hoddmímis holt "should not be understood literally as a wood or even a forest in which the two keep themselves hidden, but rather as an alternative name for the world-tree Yggdrasill. Thus, the creation of mankind from tree trunks (Askr, Embla) is repeated after the Ragnarök as well". Simek says that in Germanic regions, the concept of mankind originating from trees is ancient, and additionally points out legendary parallels in a Bavarianlegend of a shepherd who lives inside a tree, whose descendants repopulate the land after life there has been wiped out by plague (citing a retelling by F. R. Schröder). In addition, Simek points to an Old Norse parallel in the figure of Örvar-Oddr, "who is rejuvenated after living as a tree-man (Ǫrvar-Odds saga 24–27)". Theories have been proposed about the relation between Ragnarök and the 9th century Old High German epic poem Muspilli about the Christian Last Judgment, where the word Muspille appears, and the 9th century Old Saxon epic poem Heliandabout the life of Christ, where various other forms of the word appear. In both sources, the word is used to signify the end of the world through fire. Old Norse forms of the term also appear throughout accounts of Ragnarök, where the world is also consumed in flames, and, though various theories exist about the meaning and origins of the term, its etymology has not been solved. Parallels have been pointed out between the Ragnarök of Norse religion and the beliefs of other related Indo-European peoples. Subsequently, theories have been put forth that Ragnarök represents a later evolution of a Proto-Indo-Europeanbelief along with other cultures descending from the Proto-Indo-Europeans. These parallels include comparisons of a cosmic winter motif between the Norse Fimbulwinter, the Iranian Bundahishn and Yima. Víðarr's stride has been compared to theVedic god Vishnu in that both have a "cosmic stride" with a special shoe used to tear apart a beastly wolf. Larger patterns have also been drawn between "final battle" events in Indo-European cultures, including the occurrence of a blind or semi-blind figure in "final battle" themes, and figures appearing suddenly with surprising skills. Hilda Ellis Davidson theorizes that the events in Völuspá occurring after the death of the gods (the sun turning black, steam rising, flames touching the heavens, etc.) may be inspired by the volcanic eruptions on Iceland. Records of eruptions on Iceland bear strong similarities to the sequence of events described in Völuspá, especially the eruption at Laki that occurred in 1783. Bertha Phillpotts theorizes that the figure of Surtr was inspired by Icelandic eruptions, and that he was a volcano demon. Surtr's name occurs in some Icelandic place names, among them the lava tube caves Surtshellir, a number of dark caverns in the volcanic central region of Iceland. Parallels have been pointed out between a poem spoken by a jötunn found in the 13th century þáttr Bergbúa þáttr ("the tale of the mountain dweller"). In the tale, Thórd and his servant get lost while traveling to church in winter, and so take shelter for the night within a cave. Inside the cave they hear noises, witness a pair of immense burning eyes, and then the being with burning eyes recites a poem of 12 stanzas. The poem the being recites contains references to Norse mythology (including a mention of Thor) and also prophecies (including that "mountains will tumble, the earth will move, men will be scoured by hot water and burned by fire"). Surtr's fire receives a mention in stanza 10. John Lindow says that the poem may describe "a mix of the destruction of the race of giants and of humans, as in Ragnarök" but that "many of the predictions of disruption on earth could also fit the volcanic activity that is so common in Iceland." In late 2013 and early 2014, English-language media outlets widely reported that Ragnarök was foretold to occur on February 22, 2014. Apparently patterned after the 2012 phenomenon, the claim was at times attributed to a "Viking Calendar". No such calendar is known to have existed, and the source was a "prediction" made to media outlets by theJorvik Viking Centre in York, England, intended to draw attention to an event that the institution was to hold on that date. The Jorvik Viking Centre was criticized for misleading the public to promote the event. In a 2014 article on the claims, philologist Joseph S. Hopkins perceives the media response as an example of a broad revival of interest in the Viking Age and ancient Germanic topics. Jump up^ Fazio, Moffett & Wodehouse 2003, p. 201. Jump up^ Zoëga 1910 , p. 345. 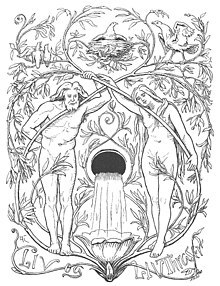 Jump up^ "reason, ground, origin", "wonder, marvel", tíva rök "the life and doings of the gods"", þjóða rök "origin, creation of mankind", í aldar rök "at the end of the world" (Zoëga 1910 , p. 345); Proto-Germanic *rakō (Bjordvand & Lindeman 2007, pp. 856–857). ^ Jump up to:a b Simek 2007, p. 259. Jump up^ Bjordvand & Lindeman 2007, pp. 856–857, for example. Jump up^ Lindow 2001, p. 254. Jump up^ Bernharðsson 2007, pp. 30–32. Jump up^ Bernharðsson 2007, p. 35. ^ Jump up to:a b Dronke 1997, p. 18. Jump up^ Orchard 1997, p. 43. Jump up^ Larrington 1999, p. 9. ^ Jump up to:a b c Dronke 1997, p. 19. Jump up^ Larrington 1999, p. 265. Jump up^ Larrington 1999, p. 10. Jump up^ Bellows 2004, p. 22. Jump up^ Larrington 1999, p. 266. Jump up^ Bellows 2004, p. 23. ^ Jump up to:a b Larrington 1999, p. 12. Jump up^ Simek 2007, p. 262. Jump up^ Lindow 2001, p. 257. Jump up^ Larrington 1999, p. 13. Jump up^ Larrington 1999, p. 3. Jump up^ Larrington 1999, p. 46. Jump up^ Lindow 2001, p. 115. Jump up^ Larrington 1999, p. 47. Jump up^ Larrington 1999, pp. 48–49. Jump up^ Larrington 1999, p. 269. Jump up^ Larrington 1999, p. 139. Jump up^ Byock 2005, p. 36. Jump up^ Byock 2005, p. 42. Jump up^ Byock 2005, p. 70. Jump up^ Byock 2005, pp. 71–72. ^ Jump up to:a b Byock 2005, p. 72. Jump up^ Byock 2005, p. 73. Jump up^ Byock 2005, pp. 73–75. ^ Jump up to:a b Byock 2005, p. 76. Jump up^ Byock 2005, pp. 76–77. Jump up^ Byock 2005, p. 77. Jump up^ Byock 2005, pp. 77–78. ^ Jump up to:a b c d e f Pluskowski 2004, p. 158. ^ Jump up to:a b c d Jansson 1987, p. 152. Jump up^ Hunter & Ralston 1999, p. 200. Jump up^ Bailey 2002, pp. 15-23. Jump up^ Wilson 1984, p. 149–150. Jump up^ Orchard 1997, p. 13. Jump up^ MacLeod & Mees 2006, p. 145. Jump up^ Jansson 1987, p. 141. Jump up^ Simek 2007, p. 189. For Schröder, see Schröder (1931). ^ Jump up to:a b Simek 2007, pp. 222–224. ^ Jump up to:a b c Mallory & Adams 1997, pp. 182–183. Jump up^ Davidson 1990, pp. 208–209. Jump up^ Lindow 2001, pp. 73–74. Jump up^ Hopkins 2014, pp. 7-12. Bailey, Richard N. (2002). "Scandinavian Myth on Viking-period Stone Sculpture in England". In Barnes, Geraldine; Ross, Margaret Clunies. Old Norse Myths, Literature, and Society(PDF). Sydney: University of Sydney. ISBN 1-86487-316-7. Bjordvand, Harald; Lindeman, Fredrik Otto (2007). Våre arveord. Novus. ISBN 978-82-7099-467-0. Jesse Byock (Trans.) (2005). The Prose Edda. Penguin Classics. ISBN 0-14-044755-5. Dronke, Ursula (Trans.) (1997). The Poetic Edda: Volume II: Mythological Poems. Oxford University Press. ISBN 0-19-811181-9. Davidson, H. R. Ellis (1990). Gods and Myths of Northern Europe. Penguin Books. ISBN 0-14-013627-4. Fazio, Michael W.; Moffett, Marian; Wodehouse, Lawrence (2003). A World History of Architecture. McGraw-Hill Professional. ISBN 0-07-141751-6. Bernharðsson, Haraldur (2007). "Old Icelandic Ragnarök andRagnarökkr". In Nussbaum, Alan J. Verba Docenti. pp. 25–38.ISBN 0-9747927-3-X. Hopkins, Joseph S. (2014). "The 'Viking Apocalypse' of 22nd February 2014: An Analysis of the Jorvik Viking Center'sRagnarök and Its Media Reception" (PDF). RMN Newsletter.University of Helsinki. 8: 7–12. ISSN 2324-0636. Hunter, John; Ralston, Ian (1999). The Archaeology of Britain: An Introduction from the Upper Palaeolithic to the Industrial Revolution. Routledge. ISBN 978-0-415-13588-7. Jansson, Sven B. (1987). Runes in Sweden. Stockholm, Gidlund. ISBN 91-7844-067-X. Lindow, John (2001). Norse Mythology: A Guide to Gods, Heroes, Rituals, and Beliefs. Oxford University Press.ISBN 0-19-515382-0. Mallory, J. P.; Adams, Douglas Q. (1997). Encyclopedia of Indo-European Culture. Taylor & Francis. ISBN 1-884964-98-2. Orchard, Andy (1997). Dictionary of Norse Myth and Legend.Cassell. ISBN 0-304-34520-2. Phillpotts, Bertha (1905). "Surt". Arkiv för Nordisk Filologi. 21: 14 ff. Pluskowski, Aleks (2004). "Apocalyptic Monsters: Animal Inspirations for the Iconography of Medieval Northern Devourers". In Bildhauer, Bettina; Mills, Robert. The Monstrous Middle Ages. University of Toronto Press. ISBN 0-8020-8667-5. Schapiro, Meyer (1942). "'Cain's Jaw-Bone that Did the First Murder'". The Art Bulletin. 24 (3): 205–212.doi:10.2307/3046829. JSTOR 3046829. Schapiro, Meyer (1980). Late Antique, Early Christian and Mediaeval Art. London: Chatto & Windus. ISBN 978-0-7011-2514-1. Wilson, David M. (1984). Anglo-Saxon Art: From the Seventh Century to the Norman Conquest. Overlook Press.ISBN 978-0-87951-976-6. Zoëga, Geir (2004). A Concise Dictionary of Old Icelandic. University of Toronto. ISBN 0-8020-8659-4.